Over the next weeks and months, new bird dog puppies will be joining families. An important first decision is picking a name for your new canine family member. The name you choose says as much about the bird hunter as it does about the bird dog. Choose wisely and you'll be the envy of your hunting party. Choose poorly . . . well, your hunting buddies won't likely let you up for air. Here is a list of alphabet ideas to inspire you to bird dog naming greatness. A is for ASPEN. Although this name is on the edge of too common, since I know three co-workers with dog’s owning this name, I must admit I love the multi-level nod to a place this name inspires. It could be referencing a town in Colorado or a favored grousey habitat. Either way, I can picture it, smell it and embrace it as a dog’s moniker. B is for Bine. Pronounced “BeNay.” I’m incredibly reluctant to put this name in print because I’ve ear-marked it for myself and believe it’s so damn cool that people are going to “steal” it in droves. And, you all know how snobbish I become when a dog name reaches too high a popularity level. So, at the risk of exposing my next dog’s name to the world, I introduce you to the Ojibwe name for ruffed grouse: Bine. Have a listen to its pronunciation. C is for Como. Wayne Carlson, a friend of mine, named his spectacular Brittany after the St. Paul neighborhood where he and his wife, Emily, reside. I love bird dog names referencing places people cherish. D is for Dude. The Big Lebowski. I don’t think I need to write any more. If you don’t get it, don’t name your dog “The Dude.” If you do get it . . . .
E is for Eve. According to Internet folklore, the band Eve 6 came up with their name after watching an episode of the X-Files also called “Eve.” I love both the X-Files and Eve 6, so naturally gravitated to this name, not to mention the underlying “Adam & Eve” references. F is for Fydrich. Fidrych references Mark “The Bird” Fidrych, the deceased Detroit Tigers pitcher, 1976 American League Rookie of the Year, Yankee killer, and pop culture transcending character. “The Bird” was known for his quirky personality, which included grooming the mound and talking to the baseball between pitches. To me, Fidrych’s nickname – The Bird – makes it a perfect fit for a bird dog’s name. Unfortunately, my wife VETOED this name during the process of naming of our last puppy. NOTE: This is also the first appearance of a recurring theme that will most likely irritate all non-Michiganders. I have a strong affinity for dog names associated with Detroit, Michigan sports figures. G is for Griswold. “Fletch” was a first-runner-up in the “F” section, but Chevy Chase hits the list with his signature character Clark W. Griswold of the National Lampoon’s Vacation series. H is for Herman. Herman, the Munsterlander . . . Thanks to anonymous STEVE for this fun name he left in the comment section of my blog Naming Your New Bird Dog Puppy. I is for Iago. “My name is Iago Montoya, you killed my father, prepare to die,” was the memorable line from the popular character in the 1987 movie, The Princess Bride. J is for Jacques. In general, I’m against using common people’s names for dogs. My biggest complaint stems from a hunt where my companion’s dog was named “Bob.” Needless to say, confusion ensued. However, I believe “Jacques” is uncommon enough a guy’s name (outside of Quebec) that it’s tailor-made for that new French Britt I’ve been contemplating. K is for Klinger. Jamie Farr’s popular character Corporal Max Klinger provides a bird dog name with a nod to all those Baby Booming M*A*S*H fans out there looking for a piece of nostalgia. L is for LaBatt. Since Pheasants Forever doesn’t currently have a national beer sponsor, I am free to admit my favorite barley soda is LaBatt Blue. N is for Nirvana. “Load up on guns, bring your friends,” is the first line of Nirvana’s breakthrough grunge classic, “Smells Like Teen Spirit.” It sounds to me like Kurt Cobain just wanted someone to go on a classic South Dakota pheasant drive. P is for Pebbles. What comes after Pebbles? Bamm-Bamm! Sounds like a great bird dog’s name to me. Q is for Q. Let’s face it, there aren’t a lot of options here; however, the simplicity in syllables makes “Q” an attractive choice, particularly for Quail Forever members. R is for Rocky. I have always loved boxers (the dog) named after boxers (the fighters). Although boxers aren’t hunting dogs, I think there is room in the bird dog niche for a few male pups named Rocky Balboa. For some reason, I think of a muscle-ripped English pointer when I think of a fitting breed for dogs named “Rocky.” Wirehairs also seem to fit the name in my mind. S is for Seven. Without a doubt, this was the most controversial letter in my selection process. I have two great friends who both own fantastic bird dogs with unique “S” names. Anthony Hauck, PF’s Online Editor, has the marvelous English cocker spaniel “Sprig,” and my radio partner Billy Hildebrand has a tremendous Brittany named “Snap.” So, I avoided the conflict and selected George Costanza’s favored baby name, “Seven.” If you’ve never watched this episode of Seinfeld, then you MUST check out this clip. T is for Trammell. 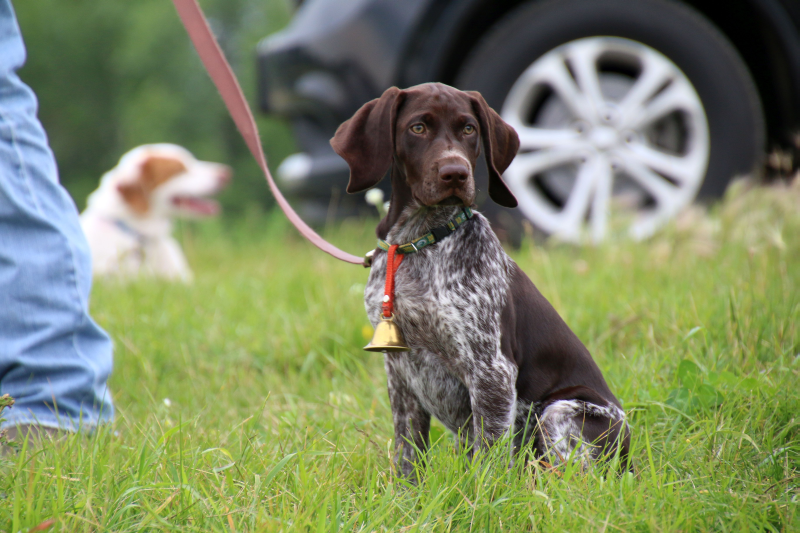 If you’re a frequent reader of this blog, then you already know my first GSP is named in honor of former Detroit Tigers great Alan Trammell, my childhood idol. “Trammell,” the dog, is my pride and joy, so I will always be partial to this name and forever reserve the right to name another pup down the road in her honor, rather than in the baseball player’s homage the second time around. It’s also important to me to point out that my childhood dog, a Brittany, was named “Tinker.” Tinker was also a great dog, but there was considerable debate between my brother and me about whether we were naming her in reference to Tinker Toys or Tinker Belle. As I recall, I was on the Tinker Toys side. U is for Uno. A simple, single syllable name for your first bird dog. X is X. It’s a simple name for a simple pointing dog equation . . . “X” marks the spot. Z is for Zetterberg. Yes, I did it again and closed out my list with another Detroit Red Wings favorite. “Z” for short will likely be my first German wirehaired pointer some ten years down the road from today. There you have it, my favorite bird dog names from A to Z. I don’t expect you to like all (or any of these). I guess that’s not necessarily the point. Dog names should be unique to the individual doing the naming and hopefully that will create some originality in the process. That being said, what’s the most original new dog name you’ve come up with as a result of reading this list? Bob St.Pierre, Pheasants Forever & Quail Forever’s Vice President of Marketing. Follow Bob on Twitter @BobStPierre and listen to Bob and Billy Hildebrand every Saturday morning on FAN Outdoors radio on KFAN FM100.3. CAPTION: Just to the right of the rooster's head you'll see my insulin pump clipped to my belt. My doctor, my mom and my wife may disagree with that order, but that’s my reality. I didn’t know jack about diabetes before I was diagnosed with adult onset juvenile diabetes at the tender age of 26, but it’s one of those diseases that takes over your entire existence, so you learn quick. You have to. From doing a radio interview to going out on my fishing boat, diabetes has added a wild card to every activity in my life; especially bird hunting. My form of diabetes, Type 1, is the insulin-dependent kind. You may be more familiar with Type 2 diabetes which develops in folks that are a little older, a little over-weight and a little less physically active. Type 1, on the other hand, is the old school needle-carrying form. At this moment, your blood sugar is probably about 84. That’s considered normal thanks to your healthy and functioning pancreas releasing insulin to manage your blood’s glucose level. My blood sugar, on the other hand, has been as low as 28 and as high as 584. At this moment, the insulin pump monitoring my blood sugar level reads 212. When I have low blood sugar, I feel weak, disoriented and starved. When I have high blood sugar, I am agitated and also have difficulty thinking clearly. Lows in the middle of the night that wake me out of a deep sleep are the absolute worst. Not only do I binge eat to get my sugar back up, it’s virtually impossible not to over-eat, so my blood sugar jumps super high. It just flat out makes me feel awful for the entire next day. The goal is to get my blood sugar as close to normal as yours with the combination of monitoring my carbohydrate intake, taking insulin injections, exercising, limiting alcohol intake and managing stress. On paper it seems relatively easy. In reality, it’s a crap shoot with every decision I make throughout the day. As a diabetic constantly monitoring my body’s reaction to food and activity, I can tell you without a single doubt that bird hunting is the most physically demanding activity I participate in throughout the year and that is compared to 5-mile runs, lifting weights or chopping firewood. Now I’m not talking pheasant hunting on the groomed paths and corn rows of a game farm. I’m talking cattail busting. 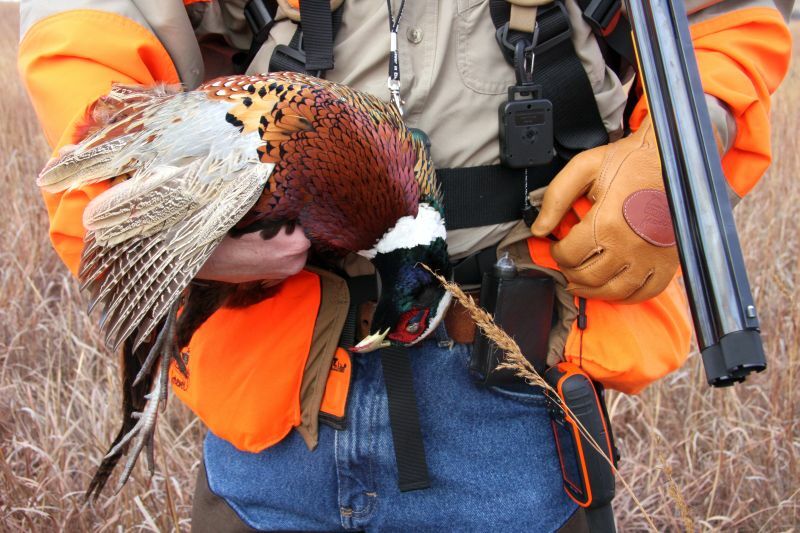 I’m talking about walking through a field of chest-high prairie grasses pulling at your legs like “Night of the Living Zombies.” Forget about P90X, take up pheasant hunting instead. Give me a plate of meatloaf, mashed potatoes, stuffing and a glass of lemonade. On a normal day, that meal might put me into a blood sugar overdose, but send me out into a snowy cattail slough in mid-December and I’ll be sucking down Gatorade an hour later to push my blood sugar back up to normal just so I have enough energy to make it back to the truck before I pass out. The moral of my story is we’ve all got crosses to bear in life. Mine is diabetes. Diabetes will likely be what kills me, but I’ll be damned if diabetes is going to be what defines me. I am a bird hunter. Bob St.Pierre is Pheasants Forever & Quail Forever’s Vice President of Marketing. Follow Bob on Twitter @BobStPierre and listen to Bob and Billy Hildebrand every Saturday morning on FAN Outdoors radio on KFAN FM100.3.